Magic Opener can open different kind of bottles at any place, at any event. Now you can enjoy the convenience to use good and effective tools while opening any can or bottle cap. Everyone will love to have these multipurpose tools at home so that all can experience the easiness that our standard Magic Openers offer to the users. By purchasing a multi-purpose Magic Opener for your home, you are simply improving your home accessories that aid you in daily house chores. An effective bottle opener can also help you a lot at an urgent situation. If there is a mischievous child in your house crying for juice or beverage or you want to impress your special guest with special drink in no time, a Magic Opener really proves like a magic for you, it will open any can or bottle cap in jiffy. And in this way, the home improvement tools are extremely helpful to improve your relationship with your loved ones and friends. Having a Magic Opener means a lot for the homemakers, without it the daily routines might be a frustrating job for busy people. The multi tasking tools also provide valuable aids to elderly people, physically disabled people and those suffering from arthritis. 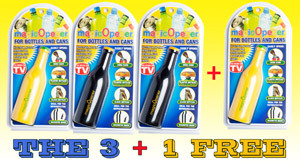 The easy to grasp and safe to use bottle openers are perfect to use for young children and people who do not have sufficient strength in their arms to open bottles caps and cans, now anyone can feel proud by doing their work on their own and feel the joy of being independent. Magic Openers are the right choice for home improvement purpose. At home we daily buy different beverages, water, beer, juice or soda that comes in a glass bottle, plastic bottle or aluminum can. No matter in whatever material the beverages come, the ergonomically designed tools can conveniently open any kind of bottle cap or can gently without much effort. Moreover, with its special shape it is easy to grip and handle. The back equipped with magnet has made it easy to store and place at any metal surface where the magnet can firmly stick. Our life time warranty Magic Openers are durable, stain resistant and easy to clean with a damp cloth. Use our economical and customer satisfying products to experience the happiness of an independent life.